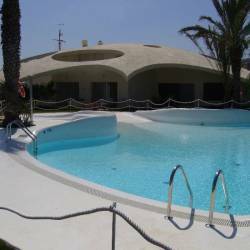 Quite area on Roda is this 2 Bedroom townhouse is one of 9 townhouses on a small 'L' shape so pool very exclusive can be rented with 3 other townhouses great accommodation to suit 2 - 12 people. This townhouse is on phase II and only a few minutes walk from the shop, club house and restaurant. It is fully air-conditioned and has fantastic views over the pool and golf course. It is well equipped with all of the holiday essentials plus lots more. Roda Golf has plenty of sporting activities as well as the golf including tennis courts, paddle courts, football pitch (5-a-side) basket ball. Roda has its own exclusive beach club on the famous La Manga Strip with beautiful gardens and spa facilities. Roda Golf Clubhouse is an located between the first Tee and the 9th hole, built on 3 levels the Clubhouse has great golf views and sun terrace where you can have a snack, tapas or full restaurant menu.. The ground floor has changing rooms with individual showers, sauna room even LCD TV. Opposite is the ePro Golf shop which has a wide range of Golf clothing and golfing accessories. This property is only a few steps from a quite pool where you can sit and relax on the terrace with a glass of wine and watch the kids swimming in the pool.